A Federal High Court in Lagos Wednesday fixed February 11 to deliver judgment in application seeking final forfeiture of $4.8 million and N7.4 billion allegedly linked to former First Lady, Patience Jonathan. 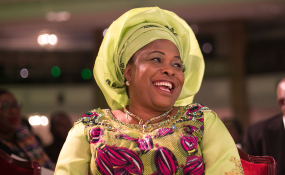 The EFCC had filed the application against the former first lady and six others. The others are Globus Integrated Services Limited, Finchley Top Homes Limited, Am-Pm Global Network Limited, Pagmat Oil and Gas Limited, Magel Resort Limited and Esther Oba, as the second to the seventh respondents, respectively. The commission had on April 20, 2018, via an ex-parte application, obtained an order for interim forfeiture of the sum, EFCC counsel, Mr. Rotimi Oyedepo, on October 29, 2018, filed an application for final forfeiture of the sum. At the resumed hearing on the suit yesterday, Oyedepo told the court that the EFCC had filed and served a further affidavit to the respondents' application to show cause. Counsel to the respondents, Chief Mike Ozekhome (SAN), however, opposed from paragraphs eight to paragraph 12 of the affidavit, and prayed the court to expunge them. In his submission for final forfeiture, Oyedepo told the court that Mrs. Jonathan, fraudulently diverted funds from Women for Change Initiative, a non-governmental organisation, linked to her. According to him, most of the funds were fraudulently diverted from the NGO to other accounts of the second to sixth respondents-companies said to be owned by the former first lady. Oyedepo said: "Women for Change Initiative is not joined in this suit; we are not asking for forfeiture of its money, the funds have been converted and that is an unlawful act." He further told the court that Jonathan signed some of the fund transfer instructions personally, and also signed using other people's names and passport photographs. Oyedepo also said as regards the $8.4 million, the first respondent (Jonathan) had not been able to disclose to the court the identities of those who made the donations. He said the EFCC attached exhibits to show that the former first lady was the sole signatory to the companies' accounts. "The funds we are seeking to forfeit from the second to sixth respondents are not funds from their legitimate businesses but those traced from the NGO," Oyedepo said.